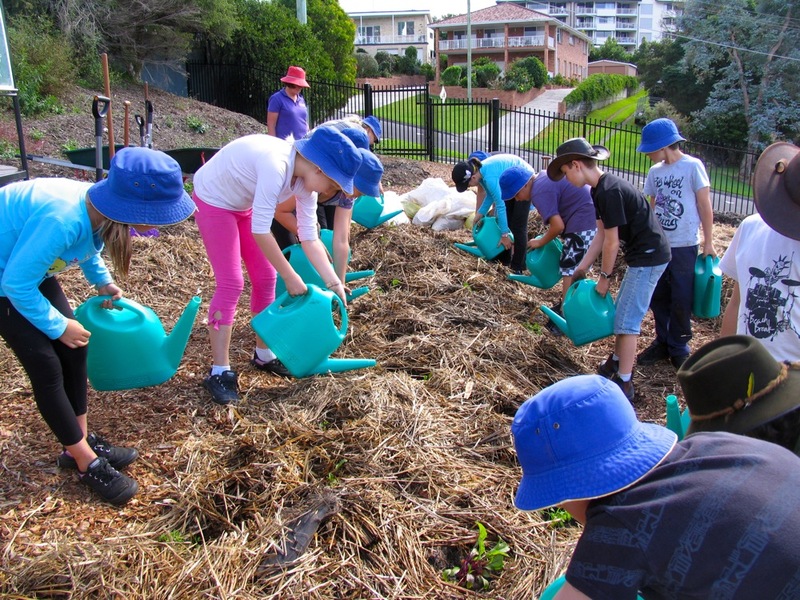 School gardens have incredible potential to provide experiential learning. But what’s the best way to go about setting one up? I’ve been wondering this for a while. 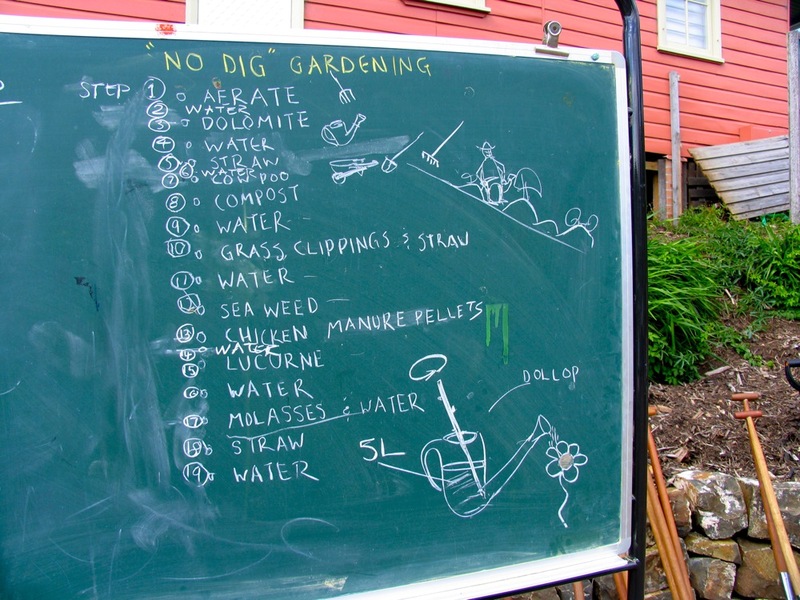 Recently I’ve been asking around amongst my esteemed permaculture colleges as to what they thought were the best school garden models they’d seen or heard of. Aaron Sorensen’s name kept popping up as a school garden designer and facilitator that really stood out. So I thought I’d better go have a look at his work. 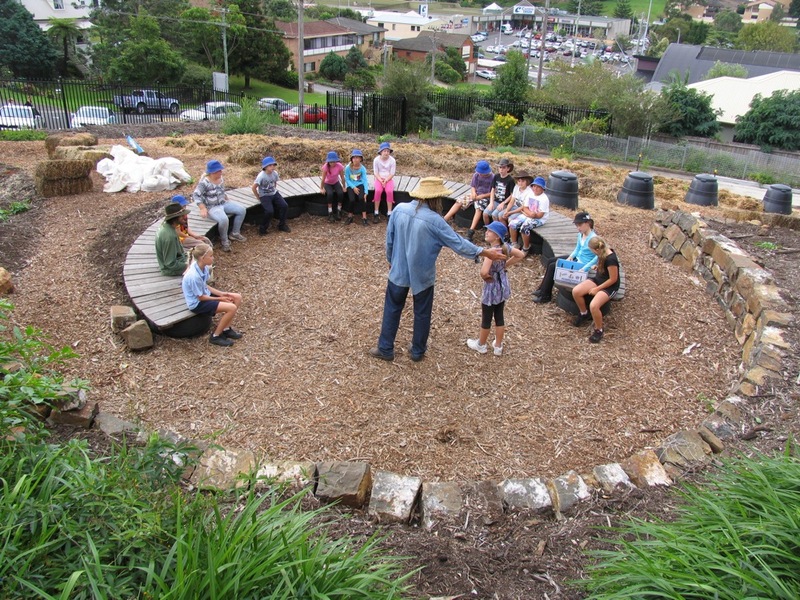 Aaron Sorensen works on his ‘Living Classrooms’ style of permaculture school garden in multiple schools throughout the Illawarra. And I have never seen anything like them. I have never seen so many little kids so deeply engaged, so empowered, and so darn skilled in a school vegetable garden learning environment. The first day that I tagged along to observe Aaron’s work, we went to Kiama Public School. 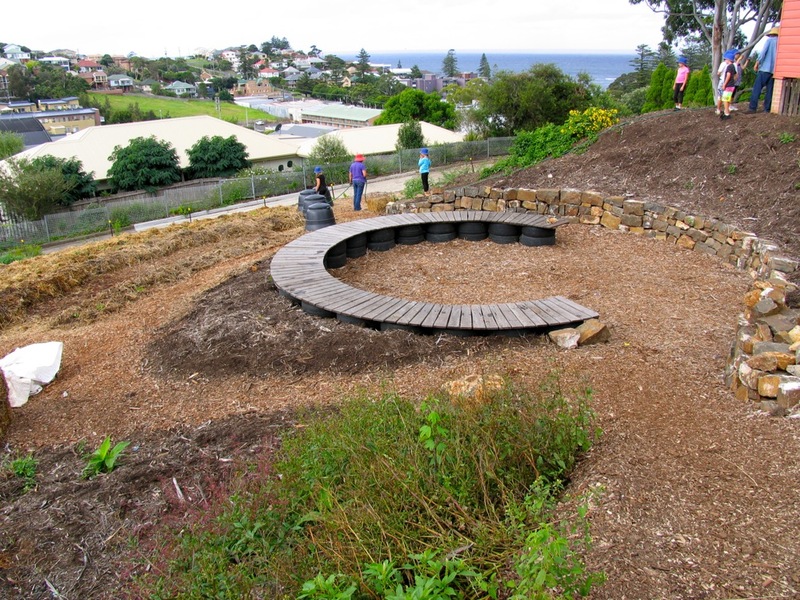 KPS has a brand new permaculture school garden designed by Aaron and run by him and Dan Deighton. The day i went along was the kids’ third day in the garden. The garden is on a steeply sloping portion at the back of the school. It’s been designed in a flowing terrace style, with swales for tree crops, 4 large contour no-dig beds, multiple nooks and crannies and a beautiful circular outdoor classroom. It’s a darn good design – a great use of space and form on a tricky site. The plan for the day. Who wouldn't want to participate in this? It’s a full-on day for the kids. 15 fourth-graders (9-10 yo) show up and proceed to run through the tools and the daily plan. 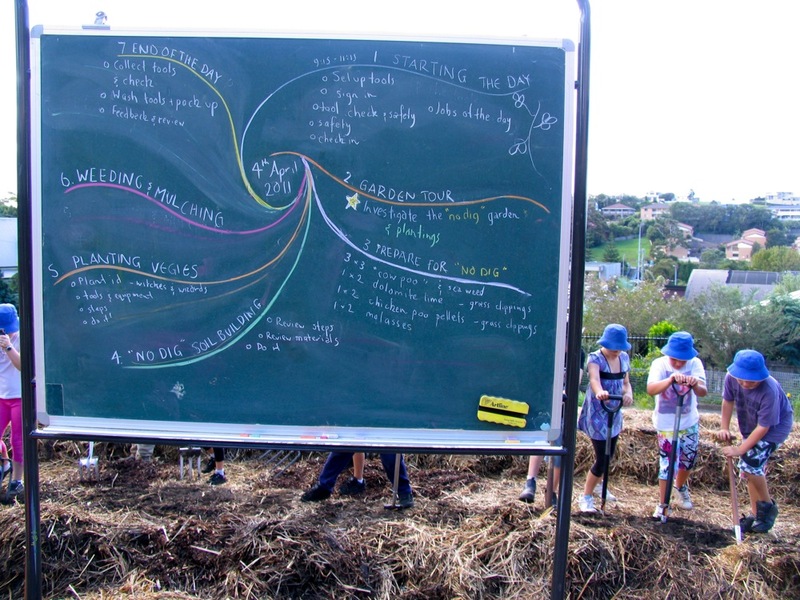 The group then collectively runs through a no-dig bed making exercise, creating a collaborative chart of what goes before what to make a no-dig bed. Not bad! The kids do it all, with Aaron, Dan and Maria (a teacher at KPS who will be part of the team) watching and helping. 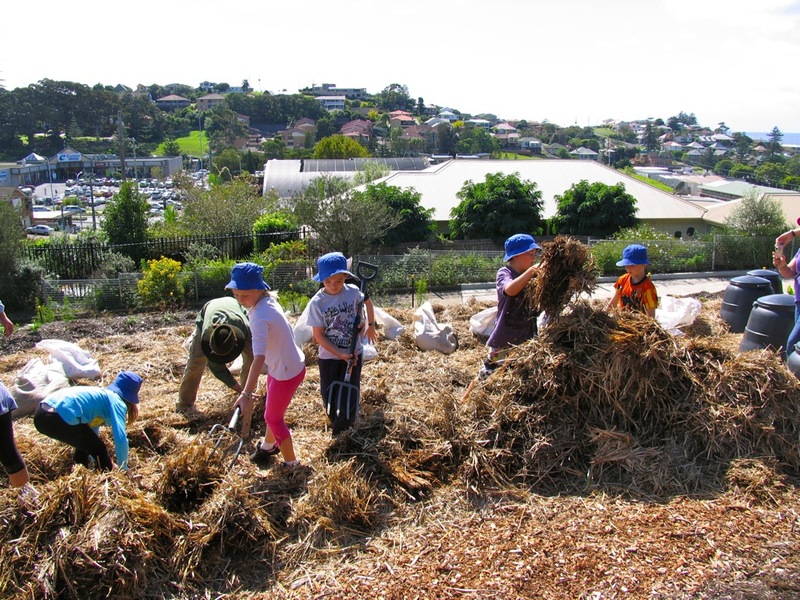 The kids aerate their future no-dig bed area with forks, they apply nutrients, they lug compost from the community garden up the street, they mulch and they top-dress. 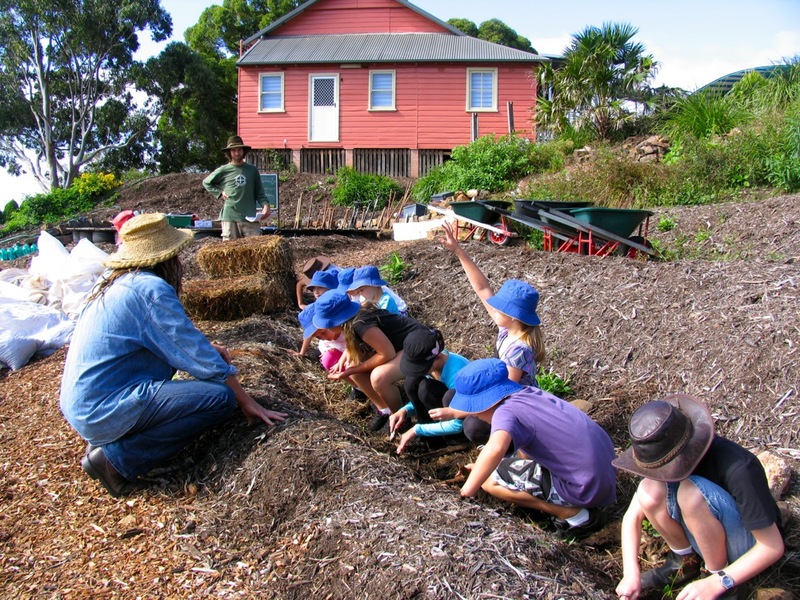 Ain’t no-one showing these kids how to plant a carrot while they all stand back, either bored or itching to have a go! They are into it every step of the way. Before the planting begins, there’s a game called witches and warlocks which is primary-school pattern recognition at its best. Once everyone (and i mean everyone) can accurately assess the difference between leeks, tatsoi, lettuce, beetroot and carrots, the team dives into their mass-planting. The whole day is incredibly active but smooth. There’s plenty of time for laughs and the hoses do water various people more than once. You can tell that these kids are stoked to be here and they all stick around until the bitter end. At the end of the day everyone washes up the tools, packs everything up and lugs it all up the hill to the storeroom. The kids clearly feel great ownership over the garden already (did i mention this was only their third day?) and all the tools are carefully put away. Even the hose gets rolled up correctly and stored. All’s well at the end of the day. The kids are in this garden one full day a fortnight, and I think the garden’s cycles are designed to work well with this rhythm. This garden is going to look amazing as it’s fruit trees and vege beds get established. I’m so glad to have seen it at the beginning of its journey! Next stop on the Aaron Sorenson Living Classrooms train is Cringila Public School, a 6-year old Permaculture school garden (and Aaron’s first). I can’t wait to see this garden I’ve heard so much about over the years. 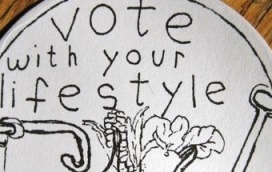 But it’s the model of working that’s inspiring me – a truly integrated approach. Look out for an in-depth rundown of the Living Classrooms model here shortly! Many thanks to Aaron Sorensen, Dan Deighton, Maria and the green team for letting me tag along, and for not turning the hose on me. And no, Aaron and Dan’s ‘Living Classrooms’ model doesn’t have a website. Yet. 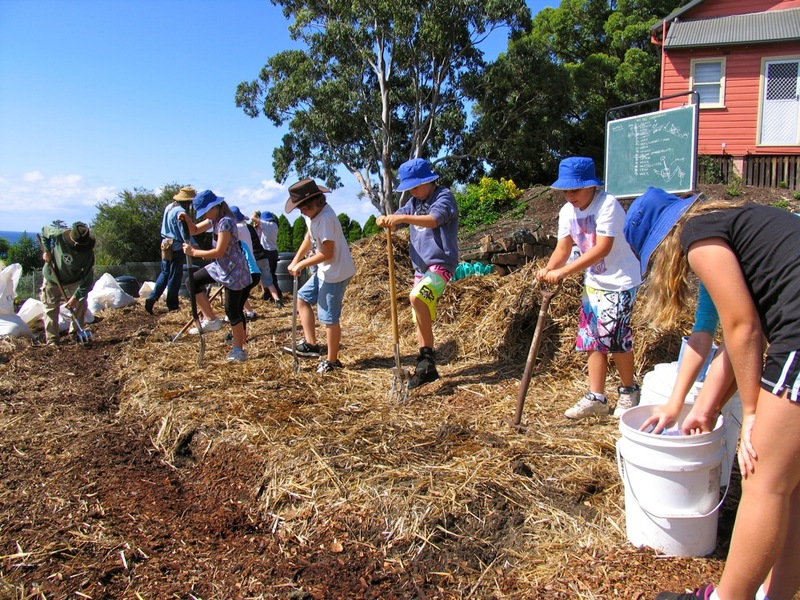 They do however contribute to The Garden, the website of the North Wollongong Community Garden. Last year on May 1st we hopped down to Sydney to see what delight . . 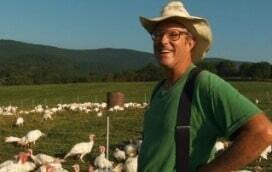 Following on from the cracking workshop we ran with Joel Salatin . .
Really inspiring stuff, Kirsten, thanks for sharing. To have kids working on something like this for a full day is quite a feat. 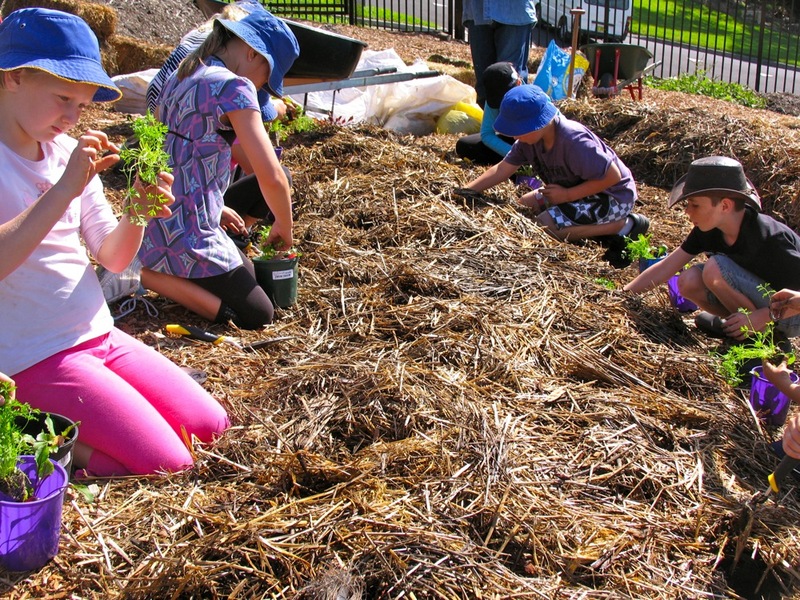 Some parents have installed a new vegie garden at my kids school, and while I admire their enthusiasm, it really doesn’t come within cooee of the garden in this post. Maybe one day! I agree with Justin, really inspiring stuff. I can’t think of any better environment to learn in. And I can’t think of too many other class room activities that touch the team work shown here. Hi Kirsten, thanks a very enjoyable blog post, the learning will be a very memorable event for the children i am sure. I want to be his apprentise ! 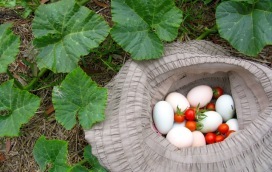 I would love to learn how to enspire the young in schools and their teachers to create edible gardens that are both attractive and productive . Now more than ever! 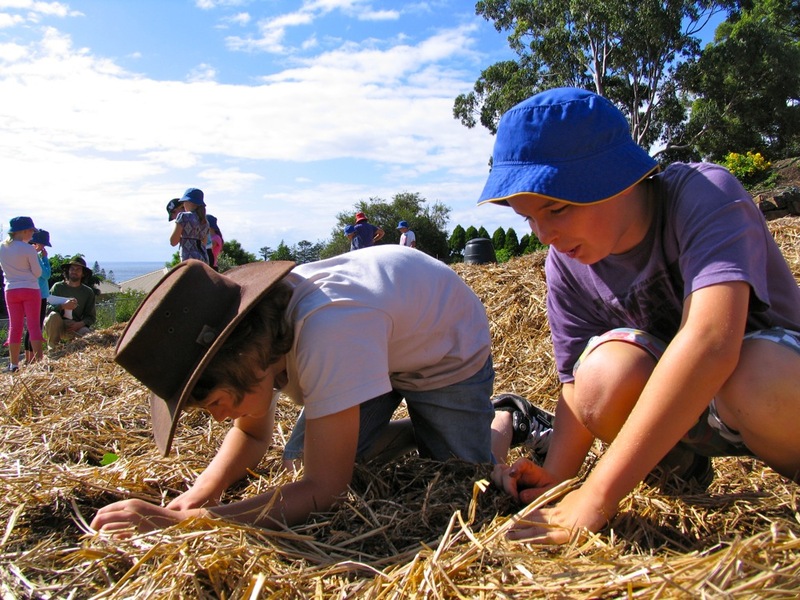 It’s an awesome garden, and a great educational programme to have the kids so involved. 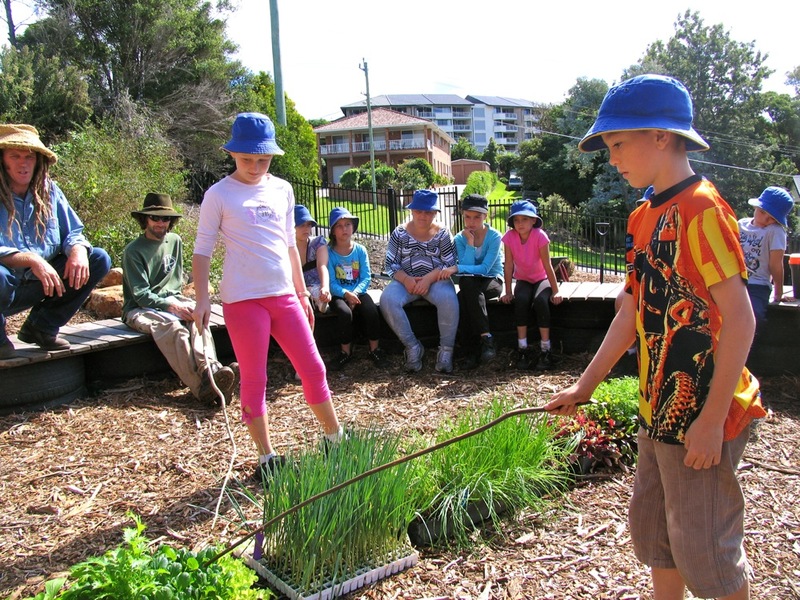 Aaron’s very good at finding all the educational opportunities in school gardens and bringing them into the curriculum. Seeing the design for this sloping site is great – my yard has a similar slope and I’ve been gathering ideas for what to do with it. That’s it, Im going back to school! Loved the seating idea. Is it just tyres stacked and wood on top? How is it held together? It’s secured with star pickets internally, i believe?